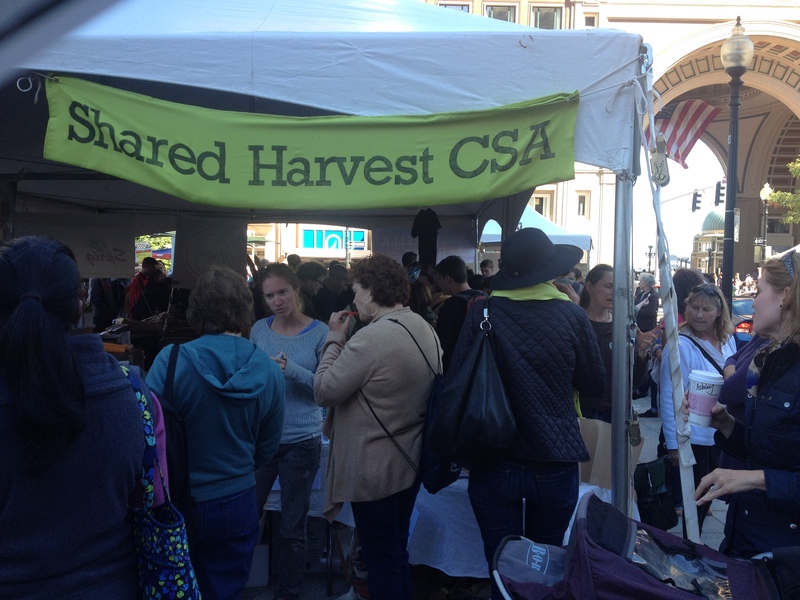 Boston Local Food Festival: Thanks for coming out! September 22, 2014 September 22, 2014 / Leah W.
A week after the fifth annual (but Shared Harvest’s first) Boston Local Food Festival, we have just about recovered from all of the madness: a chilly early set-up, doling out hundreds of samples of fresh Picadilly Farm sweet peppers and carrots with Crystal Brook Farm goat cheese, and having great conversations with all of the curious locavores in the Boston area (and many from away!). If you have found our website since, or because of, the Festival…we look forward to feeding you this winter! 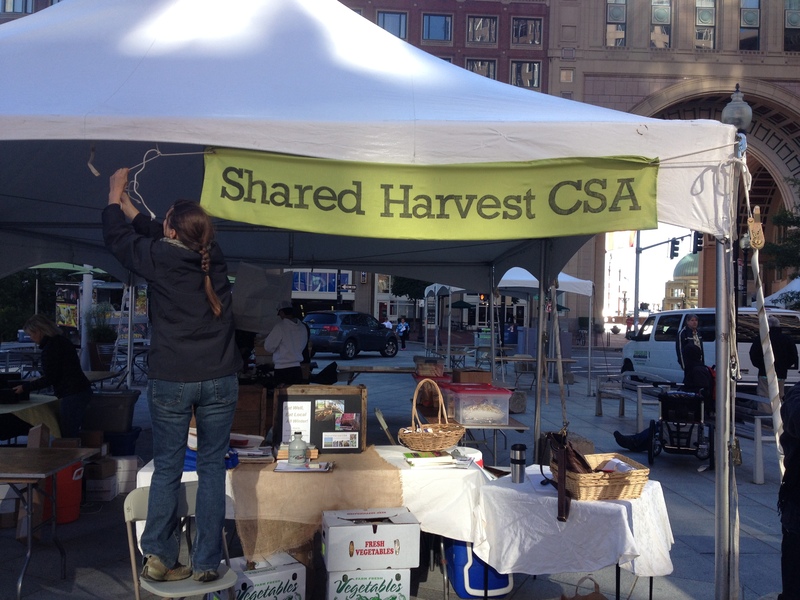 Above: Elsbeth and Jane hold down the CSA explanations, while two sweet potatoes discreetly hold down our banner in windy downtown Boston. It takes some thought to explain, efficiently, what Shared Harvest is and does. But once folks understand our winter share program, it is rewarding to keep a lively conversation going amidst thousands of people and free food samples. Sign up for your two, three, four or five month share today, and rest easy knowing that you will be eating locally into the winter and connecting with a new community. If you missed the festival, or want to be reminded of the bounty to come, find us next at the Fall + Winter Farm Share Fair, hosted by Belmont Food Collaborative. Thursday, October 16, 5:30-7:30pm at the Watertown Public Library (123 Main St in Watertown).